ISBN 1575609711. 9x12 inches. Michael DoCampo with Toby Wine. Add to your blues toolbox! 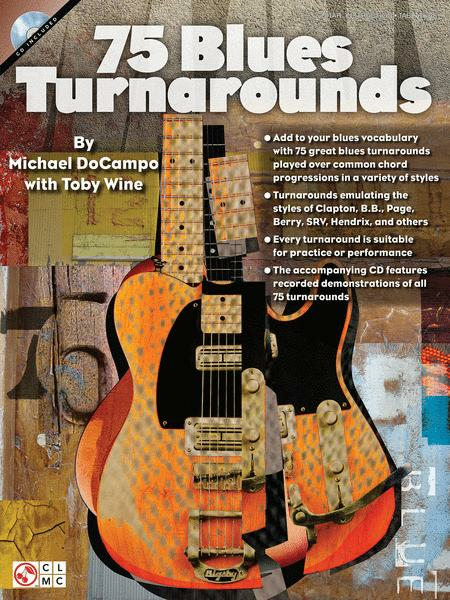 This book/online audio pack teaches 75 turnarounds over common chord progressions and in a variety of styles, including those of blues guitar greats like Albert King, Johnny Winter, Mike Bloomfield, Duane Allman, Jeff Beck, T-Bone Walker and others. Excellent material for performance and practice, with detailed info for every example. The accompanying audio includes recorded demos of all 75 turnarounds to make learning easy! The price of the book includes a unique code that provides access to audio tracks online, for download or streaming. The tracks include PLAYBACK+, a multi-functional audio player that allows you to slow down audio without changing pitch, set loop points, change keys, and pan left or right – available exclusively from Hal Leonard. Excellent! Will help anyone that needs good solid turnarounds. DoCampo is the man! Can't wait for his next book!